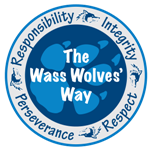 Wolf Pack meetings were designed to build a stronger sense of community at Wass Elementary and to receive instruction on character education and anti-bullying. All children K-5 will attend Wolf Pack meetings once a month for 25 minutes. Grade level and some special area teachers will be pack leaders. Wolf Packs are small groups of mixed ages and grade levels. There will be 22 packs of approximately 18 students. The child remains with this same Wolf Pack and leader for the years they are at Wass. Wolf Packs will be used to teach the character traits in The Wass Wolves’ Way. Wolf Packs will also be a great way for our students to build important relationships with different staff members and other students from a variety of different grade levels. The positive relationships that are fostered in Wolf Packs will be a great way to build community in our school! If you would like to learn more about our Wolf Packs, please feel free to contact Sarah Clos at Sclos@troy.k12.mi.us or Mark Cavatio at mcavatio@troy.k12.mi.us.